Play and Park Structures of Fort Payne, Ala., is recalling about 150 Playground SuperMax Triple Slides. A gap between the rails near the entrance way to the slide poses an entrapment hazard to young children. The firm has received one report of a gap between the rails that poses an entrapment hazard. No injuries have been reported. 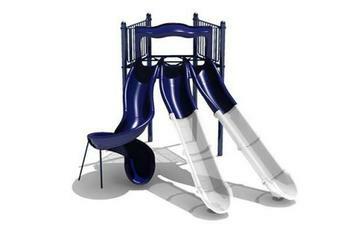 This recall involves three models of Play and Park Structures SuperMax triple slides. The molded plastic playground slides were sold in multiple colors and have three single bedways and an eight-foot deck. They are age rated 5-12. The Play and Park Structures logo and the age rating are printed on a label located on the upper part of the outside perimeter of the playground structure. Model numbers 71717 (triple slide with spiral), 71718 (triple slide hood cascade) and 71732 (triple entrance cascade with square deck) are included in this recall. The model number is printed on the sales invoice. The slides, manufactured in the U.S. were sold at independent distributors to parks, schools and municipalities from May 2014, through February 2018, for about $8,000. Consumers should immediately stop using the recalled playground slides and contact Play and Park Structures to schedule a free inspection and repair to the playground slides. Play and Park Structures is contacting all known purchasers directly. Consumers may contact Play and Park Structures at 800-809-4181 from 8 a.m. to 4:30 p.m. (ET) Monday through Friday, by email at service@playandpark.com or online at www.playandpark.com and click on “FAQ’s” at the bottom of the page for more information.